Coverings is a large trade show and it serves as a showcase for the world's finest purveyors of tile and stone. A number of nations' tile and stone industries arrange themselves into consortia and these consortia operate nationality pavilions at the show. There's the Spain Pavilion, the Brazil pavilion, the Turkey Pavilion, the China pavilion, you get the picture. With so many countries represented and with the major ones banding together in pavilions, Coverings takes on the air of a world's fair and in a lot of ways it is. Standing head and shoulders over all of those national consortia is Ceramic Tiles of Italy. 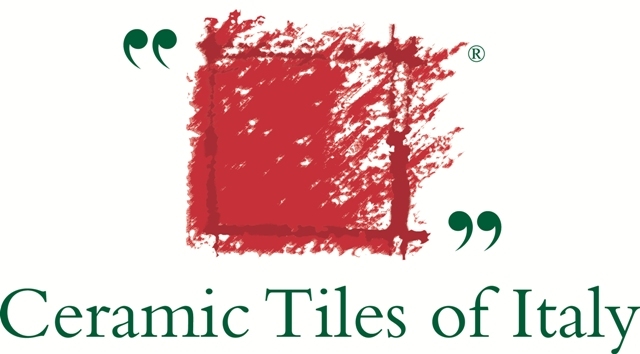 Ceramic Tiles of Italy represents hundreds of Italian tile manufacturers and there were 48 individual booths within the Ceramic Tiles of Italy pavilion. Ceramic Tiles of Italy's pavilion was a world unto itself and it had the feel as if a small section of Milan or Bologna had been dropped into the middle of the Orange County Convention Center. It came complete with a piazza of sorts. Ceramic Tiles of Italy's central exhibit was an open, multi-purpose space designed by minimalist architect Michael P. Johnson. Part sidewalk cafe, part exhibit space, the central exhibit was clad entirely in large format, Italian porcelain tile. The only things missing were cigarettes and Vespas. The term trade show booth fails utterly to describe any manufacturer's exhibit at a trade show in 2010, and this is particularly true of the Italian manufacturers at Coverings. The traditionally held, Italian values of hospitality and grace (called bella figura in Italian) are on full display and they're delivered by casually handsome men in Armani suits. It's a winning combination all around. My favorite booth of the many I saw in my two days at Coverings was in the Italy pavilion and it belonged to Mosaico+ from the Emilia-Romagna region of northern Italy. Mosaica+ makes mosaic tile as you would expect, but their unique combination of materials and exemplary way of showing their wares makes them a real stand out and they get my vote for best in show. The images wrap around the corners as you can see here. Mosaica+'s booth consisted of four, large corner panels and each featured a Warholian, pop art image. From a distance, they had the appearance of being a manipulated photograph or a boldly colored silk screen print. Upon closer inspection, it was apparent that they were glass mosaics. Upon even closer inspection, you could see that they were made from single, solid-color glass tiles. The individual tiles function like individual pixels in a video image. It's brilliant and with these displays, Mosaica+ blurs the line between commodity and art, factory and studio. The pop art exterior set the stage for the great tile inside. Mosaica+ makes mosaic tile in new and exciting combinations. The following photographs mark the first time I've ever seen wood integrated into a sheeted mosaic. And so a trend is born. Get ready to see wooden tiles take off. Coverings was an impressive and informative trade show and conference. Ceramic Tiles of Italy and partner firms like Mosaico+ are a big part of why Coverings was such a success. Bravi! Since I never had a chance to set foot in the exhibition hall, I really enjoyed this post, Paul! 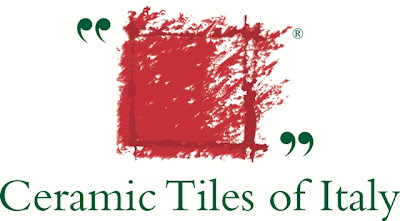 Ceramic Tiles of Italy is an incredible organization, as I saw when I visited Cersaie last fall. Thanks for this! It really did feel like a small slice of Milan had dropped into the middle of the convention center.